Neck and arm pain can be connected through neurological, muscular, systemic and/or mindbody factors. Combination arm and neck symptoms are very common chronic pain syndromes suffered by many patients with a variety of diagnoses. They are also some of the most often incorrectly diagnosed of all upper body dorsalgia problems. The anatomy of the upper back, neck, shoulders and arms is interconnected and interdependent. The nerves in the neck innervate the arms and the muscles throughout the region work together to accomplish all the physical functionality that humans enjoy. Many patients assume that arm pain in association with neck pain definitively means that a nerve is being pinched in the cervical spine. While this occurrence is a plausible reason for some symptoms, there are many other less commonly considered explanations for identical pain syndromes to exist. This detailed dialog explores the existence of arm pain and concurrent neck pain. We will examine the causes of these common pain syndromes and provide diagnostic guidance for patients who want to better their chances for effective treatment. Compressive neuropathies can develop acutely or over time in the cervical and upper thoracic spinal regions. When a nerve root becomes compressed, the initial symptoms might include pain locally, as well as in the area served by the impinged neurological tissue. 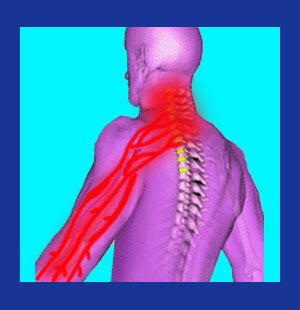 Upper spinal cord injury can create pain in the neck, shoulders and arms in some particular case profiles. Some cases of central cervical spinal stenosis can create these types of pain conditions, as well. Strained muscles, tendons and ligaments in the neck can cause radiating pain, most often unilaterally, that might affect the ability to move the neck, shoulders and arms. Pain is a common result, especially upon particular ranges of motion. Recurrent and chronic strain can be caused by injury, but may also be a result of muscle length concerns or postural issues. Certain neuromuscular disease processes can cause wide-ranging pain patterns, including symptoms in the neck and arms. Mindbody pain syndromes often act regionally, affecting nerve and muscle fibers within a specifically-targeted area, such as the cervical spine. Since the nerves and muscles here also provide motor functionality in the arms, it is common for patients to experience a diversity of symptoms in the entire upper body, unilaterally or bilaterally. The lack of proper diagnostic processing is a real problem in the dorsal pain treatment sector. Many patients are never actually examined physically and are simply subjected to some rudimentary imaging study which is used as the primary diagnostic tool. Since spinal irregularities are virtually universal in the neck, it is extremely typical for patients to be misdiagnosed with an assortment of disc and bone abnormalities that are usually thought to be innocent and asymptomatic in virtually all cases. We see countless patients being labeled as suffering from cervical osteoarthritis, when their spinal changes are perfectly normal for a person of their age. We also see similar numbers of patients being diagnosed with pathological bulging, herniated and ruptured discs in the neck, although there is rarely any evidence of neurological involvement and therefore, no possibility of the disc being the cause of pain. We less commonly see patients diagnosed with cervical scoliosis, lordotic changes, facet joint syndrome and cervical spondylolisthesis that might all be implicated as the underlying pain generating mechanism. In the complementary medical professions, physical examination is commonplace, but many patients end up with diagnoses that often lack logic or simply are not supported by any objective evidence of their existence. There are millions of patients diagnosed with cervical spinal subluxation, mostly by well-meaning chiropractic practitioners. NUCCA chiropractors are known to find atlas subluxation complex to be the underlying cause of an unbelievable variety of problematic health issues, including neck and arm pain. Similarly, millions of patients are diagnosed with an assortment of speculative soft tissue diagnoses, such as injury, imbalance and idiopathic muscular concerns, usually without the benefit of any proof that the diagnosis even exists. One of the major hurdles faced by patients is correlation of a diagnostic theory with the actual symptomatic expression. In most cases we see, the symptoms just do not align with the suspected causative process due to symptom location issues, symptomatic expression issues or duration of symptoms compared to the clinical prognosis for healing. When the diagnosis is correct, therapies should be able to resolve the pain issues within defined time-frames. However, once again, our experience tells us that most of these combination pain syndromes defy treatment or simply do not improve with the passage of time. This usually means that the suspected diagnosis is probably incorrect, although this logical conclusion is rarely considered by the vast majority of affected patients or their doctors. Treatment indication is based completely on the diagnosis rendered. However, as noted above, many diagnoses are not accurate, placing the patient on a treatment path that might not be indicated for their actual causative issue. This fact demonstrates why so many therapy modalities are completely ineffective for resolving the most common varieties of combination neck pain, such as that which affects the arms and neck simultaneously. Transient spinal causations might ameliorate organically, such as the case with many correctly diagnosed pathological herniated discs. 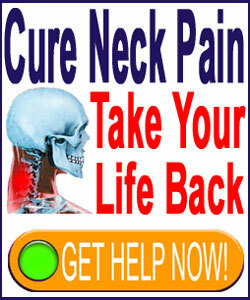 However, permanent spinal changes will not generally improve on their own or with any type of conservative care. For truly symptomatic versions of arthritis, spinal curvature, vertebral slippage another enduring problems, invasive treatment might be needed to resolve the pain. Muscular issues usually will resolve without any treatment, especially if they are simply caused by overuse or mild injury. Conservative care might speed the recuperation process for some of these conditions and the most effective methods of care might include massage, chiropractic or physical therapy. Systemic and disease-related conditions must be identified and treated using targeted methods of care in order to bring about relief. Some of these causations might be incurable, but symptomatic care can often be rendered to reduce the pain expressed. Mindbody syndromes usually utilize oxygen deprivation as their weapon of choice and create pain patterns regionally, as noted above. While many conservative care options might help to bring temporary relief by increasing blood circulation to affected nerve and muscle tissues, the only lasting way to end these insidious syndromes is with some form of psychoemotional knowledge-based therapy. Remember, when treatment fails to deliver the expected results, and especially when multiple treatments provide unsatisfying outcomes, the most logical explanation is a skewed diagnosis. Understand this basic fact and increase your odds of truly recovering once and for all.